"It is a period of civil war. Rebel spaceships, striking from a hidden base, have won their first victory against the evil Galactic Empire. During the battle, Rebel spies managed to steal secret plans to the Empire's ultimate weapon, the DEATH STAR, an armored space station with enough power to destroy an entire planet." It is with these words that the original Star Wars introduced fans to a galaxy far, far away nearly forty years ago; despite the nearly four decades between then and now though, those words couldn't be more relevant today. It is in these two short, but descriptive sentences that one can understand the basis of where Rogue One comes from and its relevance in setting up the dots that will be connected throughout the original trilogy of films. For a Star Wars fan, this is nothing if not incredible-that the smallest of details from within the universe can be fleshed out so as to expand upon the rich layers of the world George Lucas created all those years ago seemingly opens up endless possibilities. For writers Chris Weitz (About a Boy, Cinderella) and Tony Gilroy (Michael Clayton) though, one could see how this might be more than a little intimidating to take on. As one might be inclined to do in such a situation Weitz and Gilroy have more or less crafted an old school genre film out of a franchise brand that has more or less become a genre of its own. And so, Rogue One is a genre film executed in a film universe that has defined the science fiction blockbuster genre since its inception forty years ago. That may sound inherently disparaging, but it really isn't. Rather, adjusting the Star Wars universe to fit that of a "(wo)man on a mission" template is rather inspiring and director Gareth Edwards (Monsters. Godzilla) has skillfully adapted the rich and textured aesthetic of 1970's sci-fi to this story that takes place just before Princess Leia sent her trusty droids to seek out an old Jedi friend. Though Rogue One may not ultimately break any new barriers and will undoubtedly serve more as the rule than the exception when it comes to this new breed of Star Wars stories we'll be receiving consistently for as far as Disney's bank accounts can go (hint: they go really far) it is still a more than competent action/adventure story that introduces a few new memorable characters, worlds of which we've never seen before, and a narrative that despite every single person in the audience knowing where it's headed still manages to keep us on the edge of our seats. 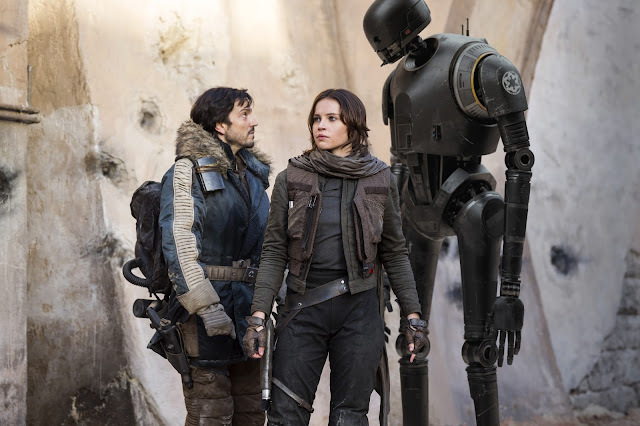 Cassian Andor (Diego Luna), Jyn Erso (Felicity Jones), and K-2SO (Alan Tudyk) prepare for war. © 2016 - Lucasfilm Ltd. All Rights Reserved. Beginning by detailing the origins of our protagonist, Jyn Erso (Felicity Jones), as a young girl who sought solace on an otherwise uninhabited planet with her father Galen (Mads Mikkelsen) and mother Lyra (Valene Kane) we watch as they are discovered by this installments big bad in Krennic (Ben Mendelsohn). Krennic is a Lieutenant Commander for the Galactic Empire who seeks out Galen for his scientific expertise and talents that will aid him in crafting and building the greatest of all weapons-a "planet killer" as they refer to it. We deduce that the elder Erso's have worked under Krennic's iron fist before and have no desire to return, but they are left little choice in the matter forcing their daughter to flee as Krennic captures Galen. The young Jyn is left hidden until family friend and extremist within the rebellion Saw Gerrera (Forest Whitaker) arrives to pull her from the depths and train her in the ways of self-defense and being a soldier. The film doesn't rest on the adolescence of young Erso though, rather it jumps forward fifteen years to show us Jyn has obscured her identity and become little more than a common criminal. It is when a Republic pilot, Bodhi Rook (Riz Ahmed), goes (ahem) rogue and seeks the now hermit-like Gerrera out at the behest of Galen to deliver a message of how the Rebels might defeat this "planet killer" that Jones' Erso is brought back into the fold as not only is she discovered to be the daughter of the leading engineer for the Death Star, but also one of the few individuals Gerrera might be willing to take an appointment with and open up to. Naturally, the initially defensive and somewhat insolent Erso cares little for the rebellion's cause and even less about the state of her father as she believes he turned his back on her and their family in order to ultimately fulfill every demand Krennic places on him. Teaming up with Cassian Andor (Diego Luna) and his reprogrammed Republic droid, K-2SO (Alan Tudyk), Jyn and her comrades she picks up along the way including Jedi admirer if not Knight Chirrut Îmwe (Donnie Yen) and sharp shooter Baze Malbus (Wen Jiang) begin the journey of recovering both the plans for the Death Star and Galen himself before things become fully operational. A trend in film throughout 2016 has been that of these rather straightforward genre exercises getting off to confident and engaging starts only to flounder where it really counts. What is at first concerning, but ultimately the most rewarding thing about experiencing Rogue One is that it delivers more in its third act than one could hope for despite getting off to something of a rocky start. 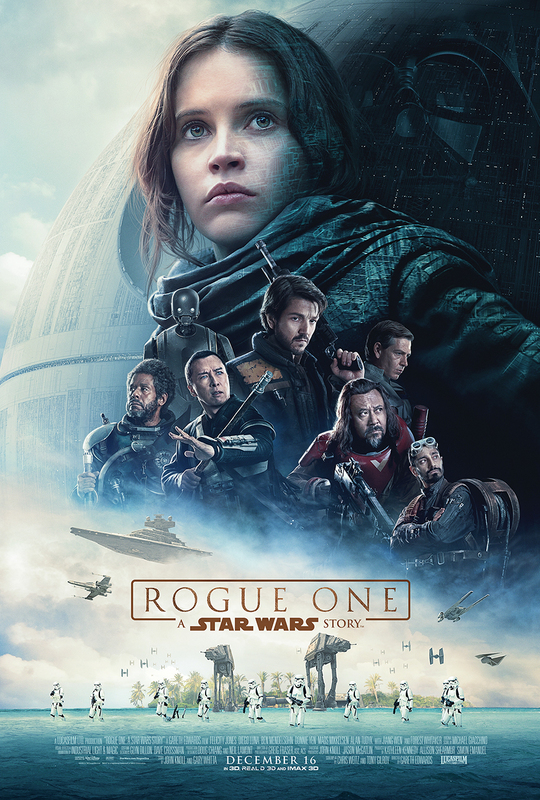 Within the first half hour to forty-five minutes Rogue One is weighed down by the stop and go nature of its pacing that has the script introducing a new planet and new set of characters and circumstances every two minutes while the story itself seems to have become stagnant if not undetectable after a rather sterling pre-credits sequence. This sidestep for the sake of set-up and plotting over a more natural flow of narrative causes the tone of the first act to feel more sporadic than that of extraneous events happening in a vacuum clearly destined to intertwine and form a cohesive whole. It is once the exposition has been completed and the objectives set that Edwards' film finally begins to settle into a groove though the lasting effect of this disconnect is that we never really connect with and/or feel a great amount of sympathy for the heroes of the story. Rather, it is the actions being taken more so than those who are taking them that become worth investing in especially given the fact most audiences will recognize the ramifications of what Jyn and her company are up to. This to say that despite Jones and Luna giving commendable and capable performances as the rebels within the rebel base there is nothing they nor the script brings to the table that allow them to stand-out or remain memorable in any way other than the fact they turn out to be solid human beings willing to make certain sacrifices for the greater good. There is nothing overly endearing about the performances or the characters and that causes a fair amount of disconnect between the plight these heroes take and our compassion towards that plight. Saving the day is that of Tudyk's derisive new droid who provides the amount of laughs Jar Jar Binks was always intended to deliver with none of the desperation. Yen's Chirrut is the other standout as not only does Chirrut make good on the promise of his Jedi-like skillset through some exquisitely choreographed action sequences, but the actor lends what could have been a throwaway supporting character depth through the small ticks and trusting nature the actor conveys through what are supposed to be empty eyes. 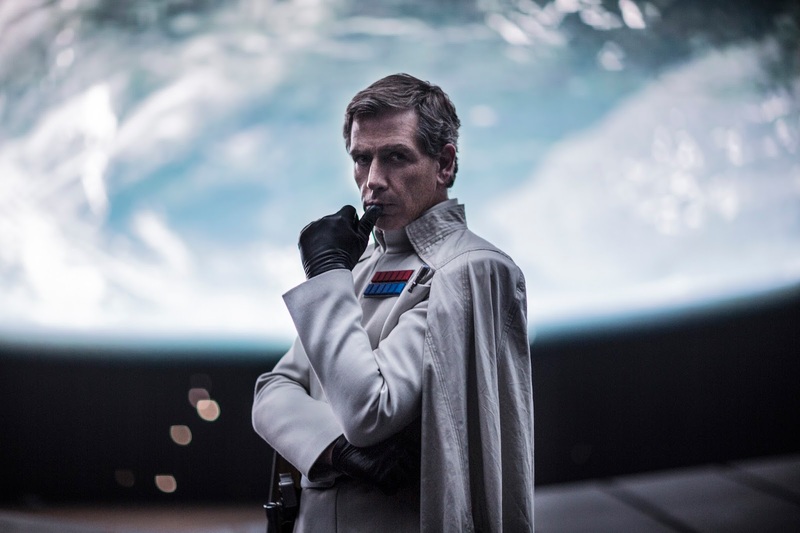 Commander Krennic (Ben Mendelsohn) is out for a serious promotion in Rogue One. In this current cinematic landscape of brand recognition and contained universes it is vital to acknowledge that good can indeed come from re-visiting the same worlds again and again. This proves to be a part of the charm through which one can choose to view Rogue One if in need of a way to make sense of how such a product can be genuinely justified. Rogue One is more or less a heist movie of sorts in that a band of heroes must take on a mission to infiltrate the bad guys lair and steal something very valuable to both sides, but that is better off in the hands of those more rational than the guys who desire to build a planet killing weapon. This movie could essentially exist in any world or any time period with natural tweaks for such amendments, but the fact it exists within the Star Wars universe and that it uses this fact to expand upon some of the lore within this universe shows the real advantage to such movies being produced. In any other film the plot strand concerning the Empire mining a city on the planet Jedha for something referred to as "kyber crystals" in order to power the Death Star would be seen as little more than a maguffin, but as it is used in the context of the Star Wars universe it deepens the mythos around the ever-fascinating lightsabers that only Jedi masters are able to wield. Details such as this enrich the film through the years of mythology that have been built up around the Star Wars brand. Some of the giddiest and more substantial moments in Rogue One come from seeing connective tissues tie together. An example of such is seeing Jimmy Smits walk on screen as the older and still wise Bail Organa who has no idea the fate he faces, but given we do his presence signals an admirable yet somber tone that would be rendered moot without the influence of the surrounding films. Of course, it is easy to argue that a film that relies on outside influences in order to be more effective isn't really a successful film within its own contained narrative and it's hard to disagree with that, but that simply isn't the world we live in now. We're existing within a world of serialized features. We're at a point where it is more common for writers and directors to find new ways of packaging familiar characters than inventing new ones. It is how well the re-packaging is executed that determines how much juice is left in the engine and Edwards delivers enough new locations and familiar imagery through fresh eyes that the visual aesthetic of Rogue One is arguably more impressive and affecting than that of the jumbled character arcs. Talk of the context in which Rogue One exists though doesn't necessarily pertain to the quality of the final product that is the subject of this review and so, while there is much to admire in the scope and visual prowess of the film especially in its blending of CGI and practical effects in some of the more breathtaking space battles we've ever seen in a Star Wars film there is just as much that detracts when we see the effects that have been used to bring Peter Cushing as Grand Moff Tarkin back to life. They are so distracting as to take one out of the film completely for a handful of minutes before adjusting to the fact that this is what they decided to go with. There was also hope Michael Giacchino's first original score for a new Star Wars film might be, well, more original, but it's a difficult line to walk and being the first to attempt such a high-wire is a losing battle that to simply come up short is to be expected of not considered a win. And yet, it is in its final act that Rogue One shines most; taking all that has come before it and funneling it into a climactic sequence of evenly paced action across multiple storylines only to culminate in a "worth the price of admission" sequence that is as tense as anyone could hope for given you know exactly what happens next Rogue One delivers on what its sets out to be. That said, while it is flat-out cool to see Darth Vader both on the big screen and operating in his prime prior to the beginning of the end if Vader is what you're going for prepare to be disappointed as sparingly is an understatement. While it's easy to admit Rogue One becomes a rollicking good time and is a pristine piece of popcorn entertainment it is ultimately a solid first step in what will no doubt come to be countless "Star Wars Stories" that will flood theaters over the coming years and if that is to be the case one can only "hope" each of them carry as much promise and vision if not a more focused narrative as Rogue One does in its attempts to both extend and expand.